Using the convenience of the Internet, eFax enables you to quickly access faxes from your laptop, desktop or wireless device. Faxes are delivered as attachments directly to your email inbox. 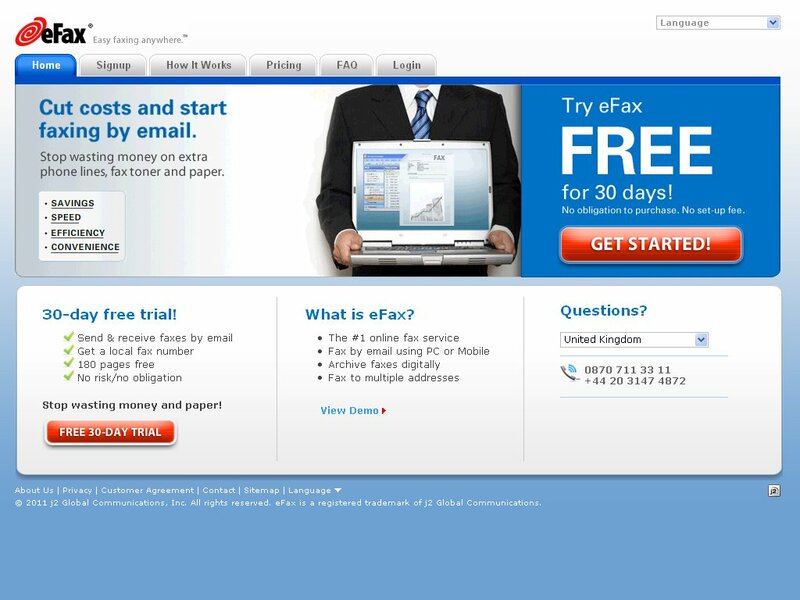 eFax is also compatible with Outlook and other popular email accounts. RECEIVE FAXES - Get a real fax number. Receive faxes as email attachments. Accounts are activated in under 5 minutes. SAVE MONEY - Smarter than a fax machine - no paper, extra fax line or maintenance needed. And it's free! ANYWHERE ACCESS - Works everywhere you access email: home, office, and on the road. eFax even works wirelessly. If you use or have used eFax in the past, please share this page using the buttons above and be sure to leave a rating and review of the service so other people can make an informed buying choice based on your experiences! It's free and you are not required to register! If you have experience with eFax, we kindly ask that you please share your thoughts with others on this website by submitting an honest, detailed review. Your feedback will help prospective clients decide which service provider to choose and is incredibly valuable to the community itself as well as eFax's representatives that read this website. Please do not use this form for support inquiries. Be aware that these reviews may also be syndicated and displayed on eFax's website, and as such a strict review policy is in effect. All reviews are moderated prior to being published, and reviews that do not contain concise, detailed comments or do not support their associated ratings will not be published. We urge you to be as detailed as possible when leaving feedback, as eFax may also use this information as feedback for their business and are themselves encouraged to reply to reviews posted to their listings. Still on phone trying to cancel account -- third try. Last 2 times they said they were too busy and to call back later. Shameful service. Stay away! Terrible, terrible customer service. They advertise a month trial free before they start to charge you. Good luck being bounced around by their customer 'service' in your fruitless attempts to cancel your service. Tip, stay away from this company. I am on a basic plan that allows up to 150 pages of fax per month. they charged mmy credit card $12 every month in the past 15 months although i did not use it much. In Februaury I happened to send more faxes. Watched my usage on their site to avoid the 150 page limit. The catch is that the failed transmits are shown "0" pages in the usage/activity but as a matetr of fact thay are counted in the 150 page limit. You have no way of knowing this until they start to charge you $15 almost every time you send a fax. eFax customer service is the worst, offshore support with no real ability. I switched to FaxAge.com, which is by far the best value and great service / support. I have no idea how on Earth how a company like this is still in business. The product is a hit or miss, unreliable and the customer service people, OMG! They have 0 training and they are probably as rude as anyone you have ever talked to. Disgusting from beginning to the end. Stay away. Companies like this one should not exist. I also think that they own MyFax too with which my experience was not any better. I wish I knew that before. There are so many ways around faxing that I'm not sure why the service is still there. This company ran me through the ringers trying to cancel my subscription. I sent them a email with all applicable data to cancel my account. They responded by tell me to call their 1-800 number. It takes about 6 minutes to make it to "cancel my account" and then they tell you to go online to cancel your account. Then you have to live chat with a person who tries to sell you on 4 other products they have. They refused to refund my account even though I had cancelled it the month prior. This is so easy to set up and start using, all can be done online, however, not so easy to get out of it, they are insisting on my telephoning to cancel because of authentication, however they didnt need me to ring before they started debiting y credit card !!!!! Stay away from e-fax. Unethical, lousy quality faxes and disrespectful. I have a mdedical practice and FAX service is essential for patient care. We get medical records, prescription refill requests by FAX. For 2 weeks in August many of our incoming FAX were unreadable. Customer service was polite for the first few calls but when we called back it was clear they had no record of the calls (pleas really) we were making to get us up and operational. More importantly they could provide no explanation for what was going on and we got different stories every time we called.We were really having fun at that point. On one call, one of the customer service representatives said they recommend that medical and law practices have back-up FAX machines availble. He completely did not get how that makes E-fax solution uneconomical and completely impractical. We decided to port our phone number out and put that process in play but E-fax stalled us at every move and it took another 4 weeks to get that done. So all our pharmacies and patients are getting happy and in on the fun now. We have switched to RingCentral now and are having some trouble with their software but its way good compared. Now here's where it gets good. E-fax kept billing our credit card and we just noticed. Our bad for sure but when we call them for the refund,1) they claim they still have the original number (they do not),2) that they gave us the number originally so they can't give us the refund (they did not we had it poreted to them from our previous telephone company), 3) we signed an agreement that the service could not be discontinue (can you imagine?). My belief about this company - they are run by crooks and don't give a damn about the service. Service OK, support very POOR. We currently have about 40 fax numbers with eFax. The service itself is good when it works. The problem is they have zero regard for you as a customer. Just yesterday, they had an outage (no faxes coming in) which costs us money, literally. We order information from places and when we don't get the fax with the info, we have to order it again (pay twice). When I got a call from an employee wondering if efax was down, I had to say 'I don't know let me call them'. When I called them, I sat on hold for about 15 minutes (which I am ok with on a normal day) with no recording about an outage. When the person came on the phone I had to give them all of our account info (which I am ok with on a normal day). Then they ask, 'What seems to be the problem?'. I tell them we aren't getting faxes at which point they finally inform me that they are experiencing technical issues and nobody is receiving faxes. Nothing in the on hold recording, nothing on the website. Then a few hours later I jump on internet chat to find out the status of the outage. Again I had to give my account info, then was told I had to call the support number, the chat guy can't do anything with corporate accounts. I told him it isn't anything to do with my account, I just needed an update on the outage. "Sorry, you have to call the number". Today service was back up with no notification from efax that is was up, or why it was down in the first place. A couple months ago we had one employee not getting faxes. I email efax support asking for assistance. 3 days later I heard nothing so I emailed again. 4 days later, still nothing so I emailed the sales team. The next day I get a response to the second email asking what my issue is. I reply immediately telling them the issue and asking if they got my first email. 2 days later they respond to the email I sent to sales. At that point I gave up and called support. I sat on hold for 90 minutes before hanging up. Called the next day and got through in 30 minutes and we solved the problem. Bottom line, service is ok, but they hate their customers. I was hesitant about using this service and the web can be misleading with reviews. So I decided to give them a call at 1 (866) 944 2980 and speak with a rep. They were very knowledgeable and answered all my questions. I'm glad I picked up the phone and educate myself. Giving efax 0.5 points is stretching it. I found the service very difficult to use, expensive, and when I wanted to cancel the service, unresponsive even to their own cancel account instructions. Their Customer Service call center is in India so expect to have a language barrier if you ever need customer support. Literally the worst experience I have ever had with a tech company. Their free trial is impossible to cancel. Hours on the phone and I still can't get rid of over $160 in charges for a service that didn't work and that I never utilized. Terrible customer service. Borderline morals. And a business model clearly driven by the idea of stealing as many recurring charges as possible - regardless to the ethics of unauthorized transactions. Caution: Confirm That You've Canceled! I Paid Over $300 for a Service I Didn't Use. If you think you've cancelled by phone (and be prepared for a long hold time when you do, by the way), confirm it! I just did the math, and it turns out I paid over $300 to eFax on an account I only used to receive a single fax almost two years ago--no other usage by me (although apparently there were a few spam faxes sent to the account). Since they had no record of my attempt to cancel by phone back in 2010, eFax wouldn't do anything for me (transcript is below). After this experience, I definitely wouldn't use this company again. Craig T.: Hello, David. Welcome to eFax online support. I am Craig Thompson, your online Live Support Representative. How may I assist you? David : I thought I cancelled this count over a year ago. I just saw that, since then, I've been billed, wow, it looks like over $200! David : I thought this was cancelled over the phone? Craig T.: I am glad to help you. Could you please provide me your fax number, registered email address and billing zip code for verification? David : There's a 2010 fax for me, and then about 9 faxes from wrong numbers. I haven't used the service to send faxes. Craig T.: Your account is active. Craig T.: We are unable to locate any prior cancellation request and hence your account stands active. Craig T.: There has been no phone contact made on this account. David : I have used this to recieve 1 fax, back in 2010, and the rest of what's here was wrong numbers. I've never sent a fax. Craig T.: There has been no cancellation request so the account remained active. David : I've spent over $300, and I've only used this account to receive one fax two years ago. Craig T.: The monthly subscription fee is charged irrespective of usage on the account. David : You're comfortable charging me $17/month for a year and a half for a service I thought I cancelled (and didn't use during that whole time)? Craig T.: There has been no cancellation request. This is your first contact with us. The monthly fee is charged as long as the account is active. It is charged irrespective of usage on the account. David : Please cancel my account. I am disappointed you are not willing to do anything for me, since you can see that this was an unused account for over a year. I will post this transcript as a warning to others who might consider signing up for this service. David : I really thought I called and cancelled, back in 2010. I understand you have no record of that, but I thought it was cancelled. Craig T.: I apologize for the inconvenience. We cancel the account when you contact us to cancel. We can't cancel the account without your cancellation request. Craig T.: I will go ahead and cancel your account. Craig T.: Is there anything else I may assist you with? David: I want to confirm that you refuse to refund any of the over $300 I've paid to efax since 2010? Craig T.: There is no refund available on your account. In looking up an answer to a question I had about my efax service, I came across this review site. All the reviews I read are negative. I realize that while there are people out there with good experiences, many choose not to review until something bad happens. I want people to understand that there are benefits to this service also. This is the second company I have worked at where we use the efax service and I was instrumental in establishing the service for both companies. We use the service in the U.S. and have no issues when sending or receiving faxes. The service was pretty easy to cancel when the first company closed and to my knowledge, no further billings were received. I have been able to modify the emails that receive notification without still receiving to the old email addresses and when we receive the faxes in our emails, they are in pdf format. The service use to require a special viewer but I believe that is no longer. I would recommend this as an alternative to a traditional fax machine any day as it assists in productivity and a company no longer has the issue of losing a fax. We signed up for the service in Spain and started testing, but the service did not work - the sending faxes reported error codes. eFax support replied quickly that we should contact the manufacturers of the sending fax machines because that was where the problem was. Of course that was too many companies to contact and as these faxes worked fine with all other machines we concluded the error to be with eFax. A few weeks later we repeated the tests with the same problems and then decided to cancel the service. Cancellation has to be done via phone, and we did so after the free trial had expired. They said that they knew about the problems in Spain but was looking to upgrade their system shortly and offered another 2 months free period. But as the service had been out of order for more than a month we said that they could contact us when it was confirmed ok again. The reply was that we had paid for half a year and no refund would be given if we cancelled now even though they had technical problems making it impossible to receive faxes from Spain. Being a Spanish company this was of course not acceptable. I've had a FREE efax recieve-only fax number for years. At first, it was great! For the 5-7 faxes I got, per year, it was a nice, paper-less, machine-less, cost-less solution. About a year or two ago, I noticed I wasn't getting faxes when I requested them. I called the sender and, each time, they would say, "I tried over and over, but it was just busy." That's NOT what I wanted to hear. I called efax and they said (somewhat rudely) there was no support for the FREE accounts. CUST SVC=3. In addition, they do not send faxes as PDF's for the free service, so you must manually convert them from their specific format to PDF, once you receive them. Not good for portability, like receiving faxes on a phone or in a library. EASE OF USE=3 / FEATURES=3. I understand that it's a free account, but I really do only send and receive a few faxes per year, and paying $6+ per month used to seem a little wasteful (every dollar counts!). But free (or not!) it's just NOT worth the hassle, embarassment, explanations, etc. of having this service. The product doesn't work well. The faxes you receive can only be opened with a special client application that you have to download. For this client to install you need admin rights on the system you are on. Something you probably you don't have when on the road. Also to convert to pdf with the client it needs to connect to some efax server over some strange port, which will probalby be blocked in a normal secured business network. >so pdf conversion not possible! Conclusion: Try some other internet fax service. I have not found the ideal solution jet. Any suggestions? I used efax successfully for a year. Efax automatically bills you after 12 months. I said I didn't want the service anymore as my business use had finished. Efax would not refund my annual subscription. I was a bit annoyed but hadn't followed the plot so I let it go. No problems yet. I then got in touch with them in Ireland and told them that as I was still paying for the service I might use it from time to time. The next I knew I received another bill for another year's subscription, with a different efax number. The Irish bloke (Efax works out of Ireland) I spoke with was completely unsympathetic and refused to do anything about it. I still get email bills from them but ignore them. Apart from this unfortunate episode, the service is good and efficient, well worth it. Just dot eyes and cross tees!